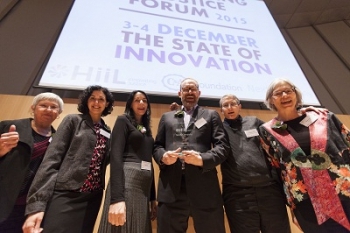 Project work kicked off when we work-shopped the idea with social entrepreneurs and international justice leaders at the 2014 Innovating Justice Forum, hosted by the Hague Institute for the Internationalization of Law. The idea for an advocacy simulation game took 3rd place in the Innovative Ideas category of HiiL’s Innovating Justice Awards. Stakeholders and potential project participants from across Connecticut convened at Greater Hartford Legal Aid for an introduction to the project, including an overview of game design and the application of games to serious subjects by Dr. Gillian Smith. 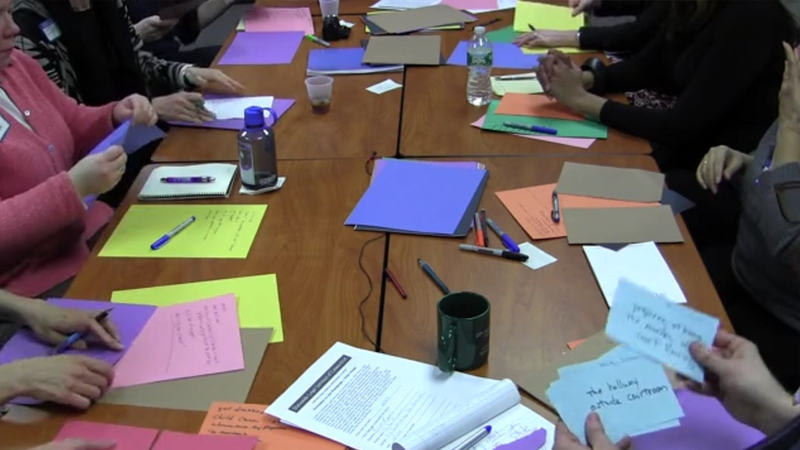 As part of the NuLawLab seminar on the application of human-centered design principles to law, four Northeastern Law students conducted end-user research and contributed to planning for collaborative design sessions that would engage stakeholders and self-represented parties, ultimately translating the self-representation experience into game scenarios. Drs. Casper Harteveld and GillIan Smith opened the doors of the NU game design studio, where nine undergraduates with majors ranging from sociology to digital media to game design will work on a host of projects, including the coding for StudyCrafter – the platform on which this simulation game will be built. NuLawLab participates in Northeastern University's Global Game Jam. This event is the premier annual game creation event that fosters the development of innovative game concepts and promotes international collaboration and teamwork. GGJ brings together thousands of game development enthusiasts participating through many local jams around the world on a single weekend. Our first co-design session challenged two teams of legal aid lawyers, technologists, and court personnel to translate the preparation and courtroom experience into fully-formed game ideas, using Dr. Casper Harteveld’s Triadic Game Design methodology. At our next co-design session, folks who had recently represented themselves joined additional court personnel, legal aid lawyers, and community advocates as we explored an important environment – the hallway outside the courtroom. 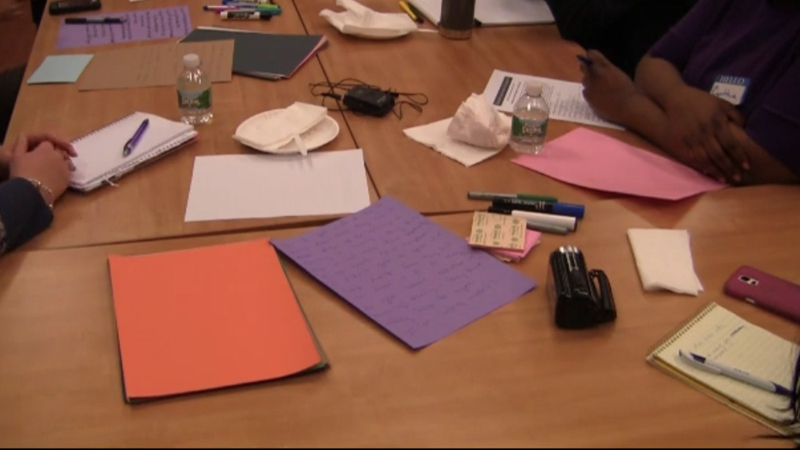 Our New Haven session included a woman in the midst of representing herself in family court. We split the group into two tables to examine the full spectrum of the experience, from preparing months in advance to the hearing itself. Co-design participants gathered in Hartford with the project team to test the first paper prototypes (one pictured) and draft scenarios. Then it was on to New Haven the next day for another productive session of prototype testing. Digital prototypes of the game were tested the afternoons of August 6th and August 13th at Main Street Creamery, Wethersfield, Connecticut. Check out the NBC News story on the playtesting. 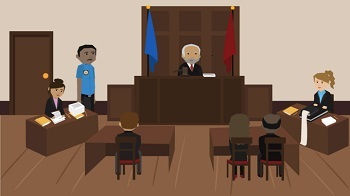 Participants at IAALS's Honoring Families Initiative Advisory Board meeting playtested the courtroom module, including Professor Julie Macfarlane of Canada's National Self-Represented Litigants Project. 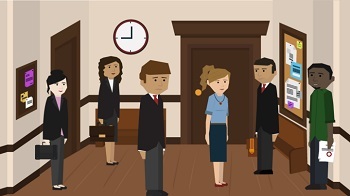 This NuLawMap chronicles the ongoing work of a multidisciplinary project team of legal aid lawyers, technology managers, experienced game designers, legal educators, law students, self-represented parties, judges, and court personnel across Connecticut. We are working in collaboration with New Haven Legal Assistance, Statewide Legal Services of Connecticut, and NU’s Playable Innovative Technologies Lab. Funding for this project has been provided by the Legal Services Corporation Technology Initiative Grants program. This project was nominated for an Innovating Justice Award for Innovative Ideas, and in December, 2014, it placed third in this international competition sponsored by The Hague Institite for the Internationalization of Law.